Around 80 Year 11 and 12 pupils from 10 different schools across Northern Ireland took part in the University’s first ever WiCADET camp (Widening Access through Computing Apps Development Training. During the 10 week ‘app camp’, teams each had to design a new market ready computer app. 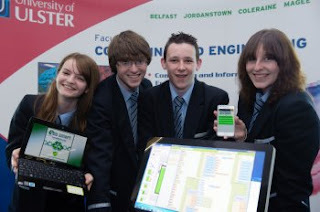 Their award winning app ‘Eco Smart’ has already generated interest among local councils keen to promote recycling. PhD student, Jennifer Gillespie, who mentored the winning Outside the Box team, explains that the aim of the app was to create greater awareness among the general public about the importance of recycling. 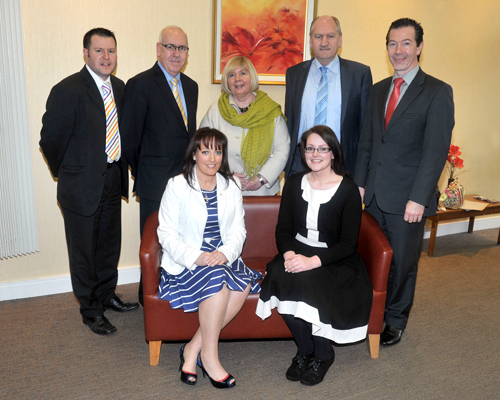 Left to right back row: Francis McVeigh OLTE Graduate, Lismore Comprehensive School, Craigavon, Mr Oliver Mooney, Principal, St Paul’s High School, Bessbrook, Geraldine Pettigrew, Principal, Our Lady’s Grammar School, Newry, Joe Corrigan, Principal, Lismore Comprehensive School, Mr Ciaran McCrumlish, OLTE Tutor, Assistant Advisory Officer for eLearning and ICT, SELB. left to right front row: Ciara McCoy, OLTE Graduate, St Paul’s High School, Bessbrook,Alanna Patterson, OLTE Graduate, Lurgan Junior School, Lurgan. On the 22nd March 2012, the Regional Training Unit (RTU) for N Ireland, celebrated its final graduation for the Online Learning and Teaching for Educators (OLTE) Programme in the Craigantlet Room, Stranmillis University College Belfast. This year seventy six post-primary teachers from across Northern Ireland schools successfully completed the RTU’s Online Learning and Teaching for Educators (OLTE) Programme. The keynote speaker at this year’s ceremony was Mr John Anderson, Managing Inspector ETI. Mr Anderson paid tribute to the success and quality OLTE has achieved over the years, in particular he said, "One of OLTE’s strategic gains has been to disseminate OLTE graduates’ e-learning knowledge and skills and consequently widen curriculum choice and foster collaboration across schools. And in that it has been most successful BECAUSE OF OLTE, WE ARE SET UP FOR ONLINE AND DIGITAL SUCCESS ". A highlight of the ceremony was Ms Alanna Patterson, teacher and OLTE Graduate from Lurgan Junior High School, who gave a presentation on her experience of delivering her online GCSE Music course to students. The Regional Training Unit (RTU) developed the OLTE programme in 2003 to meet the Department of Education’s (DE) requirement for a continuous professional development (CPD) programme that would help address the overarching goal of the Education Technology Strategy “That all young people should be learning, with, through and about the use of digital and online technologies”. The OLTE programme, which focuses on the development of online tutors skills, is accredited at Level 4 by the National Open College Network. The participants complete 3 progressively challenging units: Unit 1- Introduction to Online Tutor Skills, Unit 2 - Design, implement and tutor an online lesson and Unit 3 - Design, implement and tutor an online programme. To date the final number of OLTE graduates is 154 teachers from 95 post primary schools. They have provided more than 2000 participants with first-hand experience of learning in an online environment. From 2007/08 the Department of Education funded post-primary teachers’ places on the OLTE programme. Teachers were able to avail of a CPD programme which requires them to reflect on their practice, develop resources, plan for delivery, teach and assess their pupils in an online environment. This valuable CPD opportunity allows teachers to revisit many of the GTC Professional Competences and can be used towards Performance Review and Staff Development (PRSD) requirements. The current OLTE Graduates developed and delivered a variety of online courses to pupils from across a range of post-primary schools including, for example, aspects of GCSE Music, GCSE Geography, GCSE Irish, and AS Psychology. The Online Learning and Teaching for Educators (OLTE) Programme has now come to an end but there is a significant pool of qualified teachers within the education sector who are in a position to continue developing online courses for schools. This is evidenced by the OLTE Graduates who have gone on to develop online courses in AS Product Design, AS French, GCSE Irish, AS History and BTec Engineering for blended-course delivery.